Spring Greens needs a younger crew to commit to helping the team to set-up the site next year – the oldies can’t keep doing it by themselves! 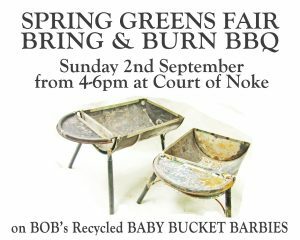 With this in mind, you are warmly invited to come and share some burnt offerings at a Spring Greens Bring & Burn BBQ on Sunday 2nd September 2018, 4-6pm at Court of Noke, nr. Pembridge, HR6 9HW. This will include a Roadside Recycling triumph of upcycling, providing a solution to Edward Bulmer’s unintended waste paint crisis. As you may know, 2018 marked the 10th anniversary of the Spring Greens event, which has grown from a small gathering of like-minded individuals into a family-friendly day out that attracts almost 1000 visitors over the course of the weekend. The burden of running an event this size has simply grown too great for the small number or people who have to shoulder it….. to continue putting on the event into the future will depend on more enthusiastic and motivated individuals to help with its organisation. 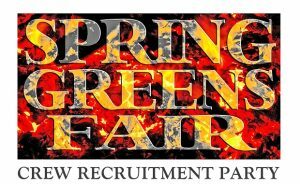 So if you would like to get more involved with Spring Greens Fair, please do join the team from 4 pm onwards next Sunday for a big Bring & Share Barbeque. Any further queries in the meantime, please find contact details here.